There are certain delights I can share with no one. Beautiful sunsets, gourmet meals, great music, these are things everyone appreciates. But when I wax eloquent about my new Number 4 ½ every one is stumped. When I tell them it’s a hand plane, most think I am losing it. But what can I say? The sight of a great hand tool fills my heart with joy! A couple of days ago I received a new hand plane from Shobha Industries, the makers of the Soba range of hand tools. This was their latest bench plane, designated the Number 4 ½ smoothing plane. It cost about ` 1200 after taxes and arrived promptly. I was of course delirious with joy but my wife could not understand the fuss about yet another hand plane. Well, I tried to explain that the #4 ½ was altogether a different beast, heavier and wider than other smoothing planes; one that any woodworker in my opinion should possess. Besides, it was a beauty with finely ground soles and sides, gleaming japanned body, chrome steel lever cap, brass depth adjustment knob, Rosewood tote and knob, heavy cap iron and a thick blade. The designation of this plane - Number 4 ½ - is due to the original Stanley Works’ system of numbering hand planes. Why a fractional system was chosen instead of another number is not entirely clear; probably because the #4 ½ was between the #4 and #5 in length and like both those planes was meant for smoothing. Comparison of Planes: The #4 on the left and #4 1/2 on the right. Notice the #4 1/2 is wider and heftier. The original Stanley #4 ½ was introduced in the late 19th century. The plane was 10 inches long, weighed about a couple of kilos and had a blade 2 3/8 inches wide as compared to a 2 inch wide cutter in the case of the #4 and #5. 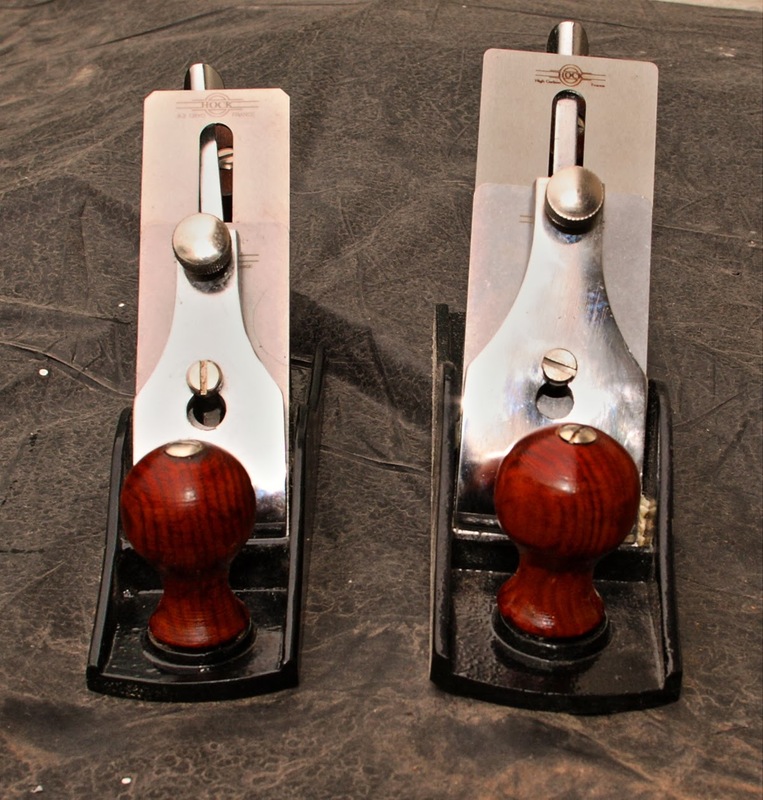 Stanley stopped making the #4 ½ in the early Sixties and since then a few top hand plane makers have taken up the manufacture of this type of plane. In India, Anant has been making the #4 ½ for many years and now Shobha has come out with its version. I have not seen the Anant plane but the Shobha plane is outstanding. The sole is dead flat, the depth adjustment knob works well, and the mouth of the plane is narrow and set to generate fine shavings. The only, though relatively minor, problem with this plane is the cap iron, which is not ground at a proper angle at the tip. 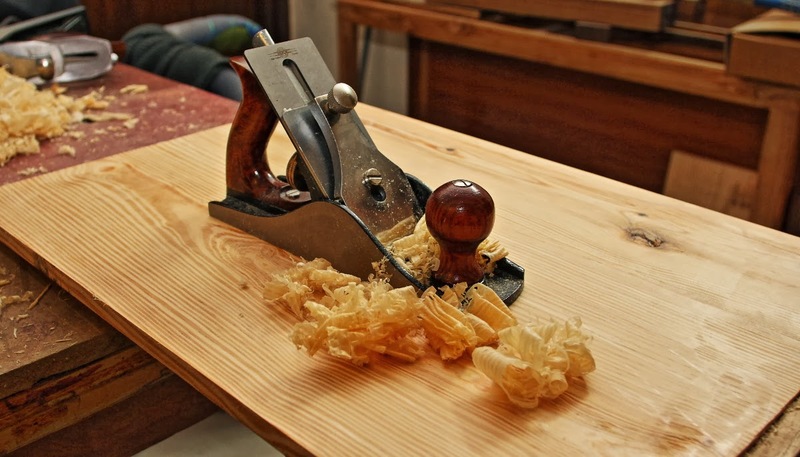 Typical shavings with a smoothing plane can be as little as a thousandth of an inch and if the gap between the cap iron and the blade is even a wee wider it will get jammed with shavings and after a while prevent the plane from cutting. The fix is relatively simple: front of the cap iron which comes in contact with the blade has to be honed either perfectly flat or at a slight angle so that when attached there is no gap between it and the blade. Fixing the problem is easy but it is a slight irritation and one that could confound beginners. Incidentally, I have noticed that all Soba planes suffer from this shortcoming. The cap irons are thick and hefty, even thicker than matching Stanley cap irons, and are otherwise machined well. It is just the underside of the tip that needs to be milled and honed to the correct angle. Otherwise the plane is delivered ready for use right out of the box. The frog assembly is dead on and holds the blade flat and square to the opening which makes adjustment easy. I found the blade iron well ground and super sharp right from the factory and did not bother to sharpen it. 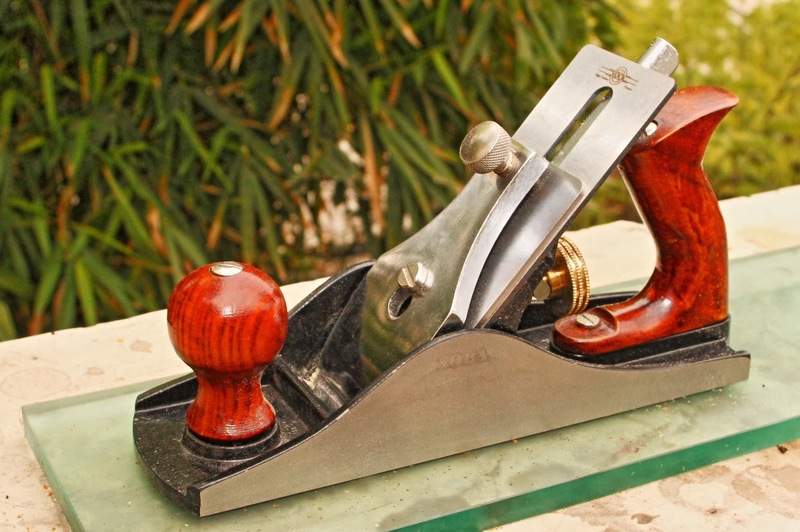 This is one plane I know I am going to use a lot, especially because I mostly have to plane locally available hardwood like Teak (Tectona grandis) which often comes with very difficult, convoluted grain. Other common Indian hardwoods such as Indian Rosewood or Sheesham (Dalbergia sissoo) and Saal (Shorea robusta) also require a sharp and somewhat heavier plane to work easily. The Soba #4 ½ is going to fit in nicely with my #5 and #4. Bring on the wood with all the knots and cross grains! I am prepared. Did you buy this online? If you did could you let me know the website from which you ordered it? Thanks. And on a different issue can the usual 'joining' work be replaced with adhesives? Thanks again. Joing work can be replaced by adhesives but much would depend on the kind of load, stress and strains the joint will have to bear. 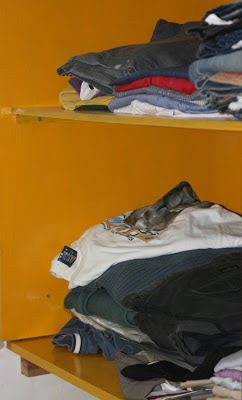 Wood moves seasonally, can also shrink over time if it has not been dried properly and so on. A joint held together by glue alone could fail. 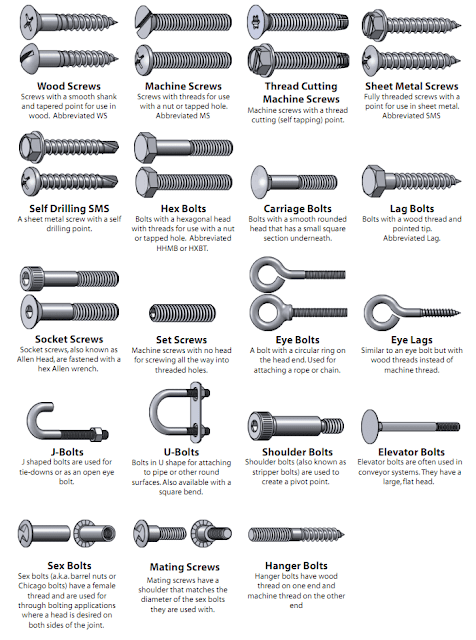 Simple joints could be strengthened with nails or screws besides the glue. Pradeep: I think the No. 4 1/2 is not listed in their website. Call them and ask for it specially. It is a superb plane as I discover every day! Please let me know what is the dimension of 4 1/2 plane as it is not listed in shobha's website. Is it 10 inch long and 2 3/8 inch wide? The Hock blades are definitely easier to sharpen and take a fine edge. However, today I am not sure whether they are worth that much extra money. Shobha have introduced a new cap iron with their blades which is much like the Lie Nielsen variety; this reduces chatter, stops shavings jam the blade and feels significantly better. The major difference I feel is in the sharpening - that is what ultimately counts. Even a thinner blade superbly sharpened will cut like a dream. So if I were to spend my money IO would do it on better sharpening products (Japanese ceramic stones) or Japanese steel blades. A2 and so on, IMHO, is somewhat overrated. Even 02 IMHO takes on a better edge. thanks for sharing. The Hock blades that I have ordered are O2, seem very well set up out of the box. My experience with the indian brands vs the fancier (Lie Nielsen etc, which I also own), has been largely a matter of setup. The Lie Nielsens come perfectly ready to go out of the box - whereas the indian planes typically take a fair amount of work to get right. I haven't used Shobha yet, but next week I should have a No. 4 to try out. I'm very familiar with Anant and other smaller brands.. I agree - most of the work comes down to sharpening blades well. In my line of work (building guitars), there is a lot of finesse required, so that's always the primary concern! That is pretty high - Rs 3,800 works out to more than 50 USD! If you are interested I could sell you one of my Shobha 4 1/2 for half that amount! I have three of them and now that seems like one too many!